Of late doctors have been spreading awareness in newspapers and health magazines about diabesity. A combination of Diabetes and Obesity has been named Diabesity. The incidence of this deadly combination is not only in Western countries, but also on a rise in India. Obesity and diabetes continue to rise at an alarming rate. Diabesity covers not only being obese and diabetic it also includes certain co-morbidities such as high blood pressure, heart disease, stroke, gall bladder disease, gastro-esophageal reflux disease, osteoarthritis, and sleeping disorders. Some studies in India have shown that around 70% of children are obese due to lack of outdoor activities. 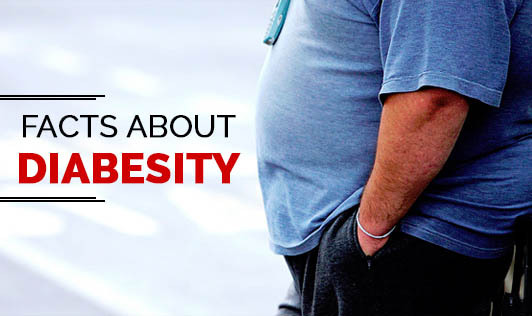 They are also likely to be obese adults with increased susceptibility to diabetes, hypertension, and heart diseases. The most worrying part is obesity related to type-2 diabetes, which is seen in children and teenagers too. When a person with diabetes loses weight, it makes a tremendous improvement in the blood sugar levels. A shift towards healthy diet can work wonders for people with diabesity. We as health experts have done our bit by spreading the awareness about diabesity. It's your turn now. Take steps to prevent this condition. Prevent spreading diabesity as an epidemic! Talk to your dietician to know more about diabesity, its causes, risks, and treatment.